There are lot of ways from which you can easily boost up data entry work in Tally ERP 9. During working on Tally ERP 9 user consume lot of time. They have to switch between different options one by one user arrow keys or by clicking with mouse to choose an option. Now you have to use given tricks which helps you to quickly boost up data entry work in Tally ERP 9 software. Most of the Tally ERP users consume lot of time during doing the data entry work. If you don’t have enough time or want to work faster then you have to use given tricks. These tricks allows you to speed up data entry work in Tally ERP 9 software. During navigation in different option in Tally ERP 9 most of the time is consumed. Tally ERP 9 allows you to use different hot keys which helps you to speed up data entry work in Tally ERP 9 software. For eg: If you want to create a new ledger account from Gateway of Tally then press A+L+C. To Create new stock item from Gateway of Tally Press I+I+C. If you want to view day book Press D+D. To view list of accounts in active company press D+L. During doing voucher entry you must have to use online calculator which directly show result in amount filed. To use online calculator press ALT+C shortcut key to get the result directly in amount filed. If you press Ctrl+N then result of calculation is shown only in calculator area. So, if you are want to boost up data entry work in Tally ERP 9 then you have to use online calculator feature in Tally ERP 9 software. Narration is an option part during making the voucher entry. We need to type the narration so that we can understand why entry is done. If you are doing entry in same voucher type and want to repeat the narration which you used in last entry then you have to press Ctrl+R Shortcut key. If you want to repeat the narration which you used in the first ledger then you have to press ALT+R shortcut key. 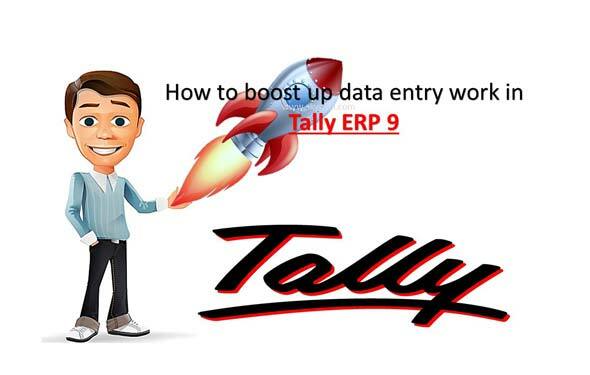 This feature allows you to boost up data entry work in Tally ERP 9. If you have to do more than one same type entry in a particular voucher and don’t want to change date again and again. For eg. If you want to do more than one sales voucher entries and don’t want to change the date. In that situation you have to turn on skip date field option. Most of the Tally users turn on lot of unwanted features during doing the data entry work in Tally ERP 9 like cost center, budget and many more. These feature consume lot of time to fill an entry during working in Tally ERP 9 software So, that you have to turn off all those unwanted features which are not useful for you. When you create any ledger, stock item then you will get alias, mailing detail, tax registration detail, statutory information and other things. If there is no need to use these features then you have to turn off them so that you can speed up data entry work in Tally ERP 9 software. During creating the ledger account or stock item you have to Press F12 and turn off all unwanted feature which you don’t need. After finish the data entry work you need to take print out of all important transactions. For eg: If you have to take all the sales voucher entries which you done on daily purpose. After saving the entry you have to use Ctrl+P shortcut key to start printing one by one. But after turn on print voucher after saving feature in Sales voucher there is no need to use this key. When you finish the sales entry it automatically goes for printing. To turn on this feature GOT > Accounts Info. > Voucher Types > Alter > Sales Voucher > Print voucher after saving – Yes option. I hope after reading this guide you have to boost up data entry work in Tally ERP 9. You must have to use these given tips which definitely increase the data entry speed. If you feel that i have missed out any thing regarding this guide then please write us in the comment box. Thanks to all.